To enable a child to cultivate the natural desire to learn. To provide a carefully planned, stimulating environment with an enriched Montessori curriculum which will help the child develop within him/her self a foundation of habits, attitudes, skills and ideas which are essential for a lifetime of creative thinking and learning. To enable a child to become a compassionate, responsible contributing member of society who is respectful of others and the environment. Children are respected as different from adults, and who differ from each other. Children possess unusual sensitivity and mental powers for absorbing and learning from the environment. The most important years of growth are the first years of life when unconscious learning is gradually brought to the conscious level. Children love work - it is spontaneously chosen and carried out with intense joy. Children need to learn by doing. At each stage in a child's mental growth, the Montessori curriculum provides activities that allow children to develop and refine their movements. The natural development of "I CAN DO IT MYSELF" is respected. 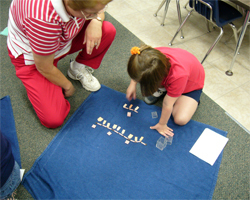 Montessori methods reflect a profound respect for the child's personality. Children are allowed a large measure of liberty (not license) which forms the basis of real self-discipline. This is a higher discipline which originates within children as they practice making their own decisions and exercising their own will. 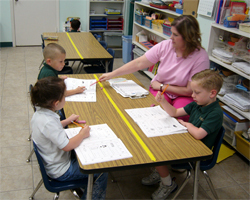 It is not a discipline imposed on the child by a teacher or based on rewards or punishments.